One of King's favorite hometown jams is the blessed Little Pigs Barbecue, nestled on theoutskirts of Columbia, SC. 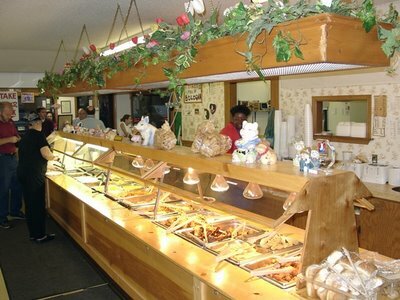 This is an endless buffet (not pictured above are the whole pig, which sits on an opposite table for pickin', and the dessert table) that sets you back $7 for lunch and a buck or two more for dinner. The full buffet is only available Thursday through Saturday (obviously there are laws in place to regulate such Jams as Little Pigs). King once went twice for lunch in three days. A true challenge, of course, would be to eat both lunch and dinner (unlike some of the lesser buffet Jams, Little Pigs doesn't close between lunch and dinner, so you could get there at 11:00 AM and leave at 9:00 PM ) for three days straight.